Israeli Prime Minister tours Jewish sites in Vilnius, once known as the 'Jerusalem of Lithuania'. 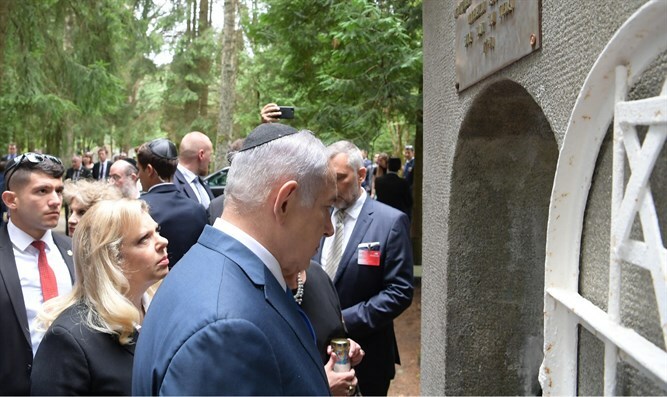 Israeli Prime Minister Binyamin Netanyahu and his wife, Sara, visited the grave of Rabbi Eliyahu Ben Shlomo Zalman on Sunday, as part of the first state visit by a sitting Israeli premier to Lithuania. Better known as the Vilna Gaon [Hebrew for ‘Genius’] or alternatively as the Gra [a Hebrew abbreviation for Gaon Rabbi Eliyahu], Rabbi Zalman was the most prominent rabbinic figure in the growing Jewish community of Vilnius in the mid-to-law 18th century. Known for his outspoken opposition to the nascent Hasidic movement, the Vilna Gaon was a prolific writer, penning commentaries on the Hebrew Bible, the Mishnah, the Talmud, and the Shulchan Aruch. The Netanyahus were accompanied on their visit to Rabbi Zalman’s grave by Linas Linkevicius, the Foreign Minister of Lithuania. The Prime Minister and his wife also visited the National Library of Lithuania’s Jewish Books Division in Vilnius to learn more about the city’s rich Jewish history. The curator of the division, Dr. Lara Lempertiene, met with the Netanyahus, and showed them antique books from libraries throughout Lithuania before the Holocaust, including a commentary on the Book of Psalms from 1512 and writings by the heads of yeshivas in Lithuania, children's books, and textbooks in Yiddish from the Lithuanian education system from before World War II, as well as and the writings of Zeev Jabotinsky, Chaim Nachman Bialik and Saul Tchernichovsky among others. “What a rich world this was; what has been lost!" lamented Netanyahu. "We are at the Lithuanian National Library. There is a treasure here from 'Jerusalem of Lithuania' beginning with books from the Gaon of Vilna and commentaries on the Book of Psalms through the letters of Bialik. “I am very moved to see here a postcard from Tchernichovsky. My father edited Tchernichovsky and Tchernichovsky recommended my father to Alexander Aaronsohn. Bialik was in the same yeshiva with my grandfather, in Volozhyn.